Freya Grand’s paintings have grown out of journeys to many uninhabited places – places possessing particular power, requiring time and immersion to absorb. These works are a record of those experiences. The other-worldly quality of the uninhabited mountains and dunes of the Skeleton Coast in Namibia or the cold peaks of Patagonia, the tactile collision of sea and sharp rock in Northwestern Ireland, the silence and the wind, these are the experiences that engender a heightened sense of curiosity and of wonder. The paintings that result from these journeys reside partly in reality, yet they are not realistic. Although descriptive, they do not reproduce the visual record so much as the experiential one. 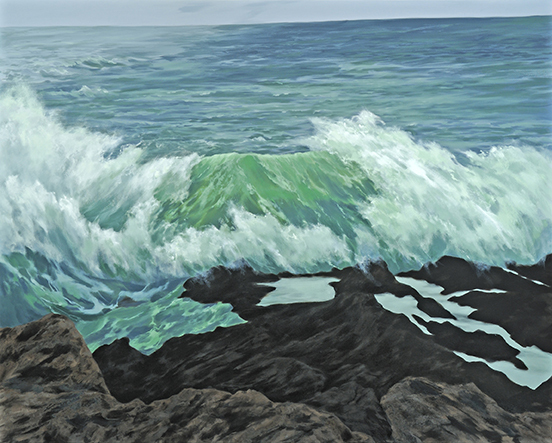 Freya Grand had a solo exhibition at the National Museum of Women in the Arts in 2013 and has exhibited widely in the Mid-Atlantic region and Chicago.